Guadalupe Federico, PhD, was selected to receive the 2019 Maria Teresa Velez Outstanding Mentor Award by the UA Commission on the Status of Women (CSW). The prestigious award honors individuals who have significantly demonstrated an outstanding commitment to mentoring and who are making a difference within the University of Arizona. She will be presented the award during a ceremony on April 9. On February 23, 2019, the 13th annual Banner Southwest Liver Disease Symposium (pictured above and to the right) was held. 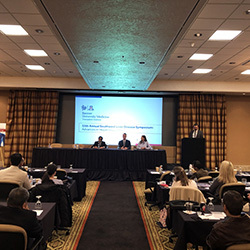 A panel of nationally recognized speakers provided updates on treatment, controversies and best practices for conditions that affect patients with liver disease. This year, there were state-of-the-art lectures and updates on non-alcoholic steatohepatitis (NASH), hepatocellular carcinoma (HCC), hepatitis B, PBC and PSC, coagulation in Liver Disease, as well as hepatology emergencies. The course — which was held at the Scottsdale Resort at McCormick Ranch — had a record attendance with 115 registrants. This annual symposium highlights the Banner and UA College of Medicine – Phoenix commitment to improving the health of patients with liver disease and the dissemination of medical knowledge to the community. The Advanced Liver Disease Center and Banner Transplant Institute are growing at an extraordinary rate. In 2018, the facilities performed 120 liver transplants, ranking them 15th in the nation for volume. Both continue to provide quality and compassionate care to a complex and challenging patient populations, while maintaining excellent outcomes. Martha Gulati, MD, MS, division chief of Cardiology at the college was selected to receive the 2019 Bernadine Healy Leadership in Women’s CV Disease Award by the Awards Committee and Board of Trustees of the American College of Cardiology. The award will be presented to her at the Convocation of the College’s 68th Annual Scientific Session in Washington, DC, on March 18, 2019. Residents and faculty from the UA College of Medicine – Phoenix's Internal Medicine Residency took top honors in an academic competition at the American College of Physicians. Audrey Lee, MD, received first place in the Patient Safety/Quality Improvement Poster competition. Tae Change, MD, placed first in the PGY1 Poster competition. Waseem Albasha, MD, Cris Molina, MD, and Maria Martin, MD, placed first in the Doctors’ Dilemma competition. Allison Bigeh, DO, placed second in the Oral Clinical Vignette competition. Victor Karikari, DO, placed third in the Case Report Poster competition. Cheryl O'Malley, MD, FACP, was awarded Chapter Laureate. Michael Fallon, MD, FACP, was named Researcher of the Year.